Sharon Rosenblatt confesses she suffers from self-diagnosed workplace paranoia–and even her company’s unrestricted vacation policy sometimes (negatively) affects her psyche. Though Rosenblatt asserts her guilt trips are self-generated, a recent study of more than 5,600 workers conducted by CareerBuilder found that 12% of participants say they feel guilty that they’re not at work while they’re on vacation. 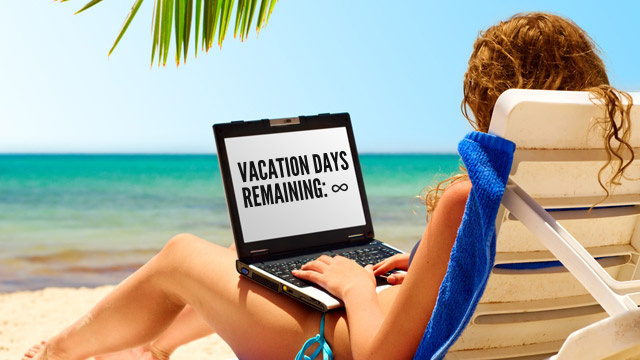 Of the majority of workers planning some time away from work, three in 10 aim to take the office with them on vacation. Thirty percent reported they will contact work on their time off, up from 25% in 2010, according to CareerBuilder. Is it any wonder then, that plenty of businesses like Accessibility Partners, IBM, and Netflix have sent their vacation policies packing? The concept unlimited time off hasn’t reduced workplaces to chaotic anarchies. Instead, it’s created more efficiency, at least according to Dharmesh Shah, cofounder and CTO of Hubspot. Shah says Hubspot doesn’t track anyone’s time off, so it’s hard to know if the policy makes people more or less wary of taking vacation. “One thing we are pretty sure about is that it’s a less stressful way to manage it,” he says. Rather than hoard days for times when they really need it, then scramble to take days at the end of the year (or fight for extra pay for time not taken), Shah says Hubspot’s open, unlimited vacation policy makes all of these problems go away. “Employees take the vacation when they need it and we don’t have a spike of vacations at specific points of time,” he explains. Hubspot’s had this plan (or lack thereof) in place for two years, thanks to CEO Brian Halligan’s desire to disrupt the dinosaur corporate culture depicted in AMC TV’s Mad Men. Laura “@Pistachio” Fitton says that since HubSpot implemented the policy, the company has been ranked as the #2 fastest-growing software company on the Inc. 500. GoHealthInsurance.com also implemented an unlimited vacation policy, in keeping with the company’s free-spirited culture, which includes a (hopefully tongue in cheek) “no pants and purple hats” dress code, i.e. : no policy at all. With a business model similar to Priceline, the company recorded a 200% increase in growth this year. Which often means people are actually on the clock more than ever. Shah admits that he works from home “a lot,” often putting in odd hours: “Until about 2 a.m. every night, and just about every weekend.” Fitton, founder of the Twitter app store Oneforty, which was acquired by Hubspot, was actually using a day off for emergency childcare during this interview–hardly a day at the beach. Worker bees may be buzzing happily, but eventually everyone needs a real break. That’s why the 17-year-old Motley Fool, a multimedia financial-services company, established “The Fool’s Errand” five years ago. Spokesperson Alison Southwick says it’s a monthly ritual where, at a meeting of all 250 employees, one name is drawn from a hat. That person must take off two consecutive weeks sometime in the ensuing month. Southwick says it’s purpose is twofold. “First, it helps make sure that people ARE taking time off, clearing their heads, and recharging their batteries. Second, it helps us fight against single points of failure within the company. When you suddenly take two weeks off, you need to make sure that other people around you understand what you do so that the company doesn’t come to a screeching halt if you’re gone,” she explains. But, mostly, it is fun. “Imagine being told you must take two weeks off right away. It’s two weeks to do whatever you want: tackle a life-long dream, learn something new, or just relax at home,” Southwick says. ← How Much Should a Start-up CEO Make?